Displaying its ability to innovate in the area of LED lighting technology, ADJ’s Inno Beam LED is an extremely powerful and highly versatile new Moving Head fixture which takes high-power/low-consumption lighting to the next level. 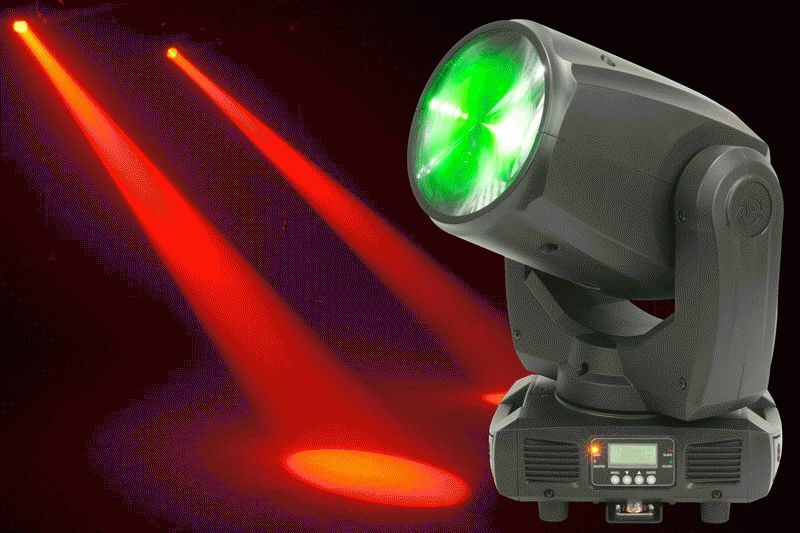 This forward-thinking high-output Moving Head is powered by a bright white 80W LED source and utilizes a tight 6-degree beam angle and eight colors, plus white, to deliver an extensive range of mesmerizing mid-air beam effects. The Inno Beam LED’s versatility comes from the palate of options available to lighting designers, such as the beam reducers, frost filter (for wash effects) and its 8-facet prism. Even if users are limited on power, as and mobile entertainers and productions sometimes are, the 80W LED consumes little energy while still providing far-reaching powerful beams, so the fixture remains ideal for use in a wider lightshow. This low power draw of 129W (max) – which is considerably less than comparable discharge lamp powered beam Moving Heads – also makes the Inno Beam LED great for use in productions or events, with the unit being affordable to run as part of an extensive lightshow used in a long-running stage production. The LED light-source is also environmentally friendly and cost-saving, as it should never need to be replaced due to its 50,000 hour life expectancy. Further awesome effects can be achieved by using the 8-facet prism, which creates hypnotic aerial effects and a spectrum of dazzling color when enhanced by the independent color wheel. Using the laser cut GOBO wheel, with four GOBO patterns and four Beam Reducers, users can vary the size of the beam, allowing for far-reaching effects and, using a tighter angle, precise beams perfect for pin-spotting. This makes the fixture highly versatile; ideal both for tours, clubs and for mobile entertainers working weddings and other private parties. With separate color and GOBO wheels, users have a choice of colors for any occasion; whether it’s a wedding, a party, or a corporate event – and GOBOs allow for unique patterns to further enhance the user’s lightshow. This range of colors combined with the fixture’s staggering pulse and strobe effects makes the unit perfect for creating pure lighting excitement on club dance-floors, especially when catering for younger clientele. GOBO shake and scroll effects offer further possibilities, making the Inno Beam LED a versatile as well as powerful lighting fixture. Thanks to the Pan/Tilt Inversion mode, users can achieve a professional-looking lightshow which will be synchronized and symmetrical even when using Inno Color Beams in sound-active mode, resulting in eye-catching effects and an experience of pure lighting excitement for their audiences. This feature is ideal for mobile DJs or touring acts that need an effective lightshow with which to impress their audience but don’t want the hassle or complexities of programming and running a DMX show. For a wider wash effect users can broaden the variable beam angle and apply the internal frost filter for a dispersed, far-reaching wash – ideal for enhancing a band or touring artist’s stage performance, either as part of the act’s tour setup or installed in a venue or club. Strobing and pulsing can also add a unique extra dimension of performance-enhancing effects to the lightshow of a touring band or act. Adaptable to any situation, the flexible Inno Beam LED offers users a choice of three operational modes: DMX Controlled, Sound Active and Internal Show. For users who want total control over the fixture and its features, two DMX channel modes are available. In 12-channel mode, users have control over 540-degree pan and 210-degree tilt, including movement speed; a choice of colors, including split color and rainbow effects; a selection of GOBOs and GOBO shake effects; prism effect and rotation settings; 0-100% dimming; frost filter; shutter speed, for pulsing and strobing; and a choice of five dimmer modes (Standard, Stage, TV, Architectural and Theatre). The two extra channels on the 14-channel mode give users further 16-bit fine control over pan and tilt – offering precise positioning and increased control. For users wishing to avoid DMX-addressing, the Inno Beam LED comes with four built-in shows, offering pre-programmed lightshows with which users can ‘wow’ their audiences. For basic control over these preset shows, the Inno Beam LED is compatible with American DJ’s UC3 Series easy-to-use controllers, which are sold as an optional add-on, so users can simply plug in and get started straight away. The Inno Beam LED is lightweight and small in size, making it easy to set-up and store in transit as part of a portable lightshow, but also works well included in a venue installation due to its powerful wash and beam effects. No matter how the fixture is used, IEC AC in/outs allow users to daisy chain power, linking up to three Inno Beam LEDs at 120V – meaning its unique effects can easily be amplified by adding multiple fixtures to any lightshow. For touring acts or productions that operate abroad, the Inno Beam LED allows multi-voltage operation, so six units can be daisy chained at 230V – only furthering the adaptability of this unique fixture.